The coalition of two male cheetah brothers were located next to Skimmer Pan. We watched them drinking and followed them as they tried to hunt, however unfortunately they bumped into a pride of eight lions and ran away in fright. Later in the month we were thrilled to see a new coalition of four male cheetahs; they were a bit shy but we were able to watch them from a distance. The three cubs of Wapuka Pride were sometimes left behind whilst the adults were hunting. One time as we were watching the youngsters a clan of seven hyenas came around trying to kill the cubs, but the little ones were clever enough to climb up a tree and escape. One time we tracked the whole pride as it was moving along the woodland and saw them taking down a zebra foal. The two resident males, known as Sebastian and Old Gun, dominated the kill and chased away the females. We also saw the pride lying full-bellied after eating a wildebeest and a different time the males were found feeding on a warthog. Old Gun gave our team a good early morning wake-up call one morning by roaring right outside the staff village! We were quickly able to get out on morning drive to find him. Bonga Pride were also in the area and these lions seemed to be specialising on blue wildebeest as we saw them a few times on different carcasses. One time the pride we were watching the lionesses and the two big males came in to take over the kill. The females started roaring and we heard other lions respond. We went to check on who was calling and found it was a different pride altogether who were busy hunting baboons. A clan of three spotted hyena were scavenging on the remains of an elephant calf. The resident pack of two wild dogs popped up one morning as guides and guests were enjoying a morning tea break. We quickly packed up and followed them hunting impala and red lechwe. Later in the month another pack of six adults and one puppy were tracked for almost three hours and we found them lying under the trees. We returned in the afternoon and the patient work of the morning was rewarded by a hunt, culminating in them bringing down and eating an impala lamb. We saw this larger pack hunting a few times and once finishing off a warthog. The resident female leopard known as Jane was in the area. One time we followed her hunting, but she seemed reluctant as she was being followed by a hyena who seemed to be hoping to steal a kill from her. A few days later we were watching her as a warthog ran out of the bushes. Jane then investigated further and found a warthog burrow. She proceeded to kill all three piglets, one after another. The following day, we were thrilled to realise that she was nursing newborn cubs and we were able to see her carrying them from one den to another. Jane’s now adult son, known as Fisherman was tracked until we found him. 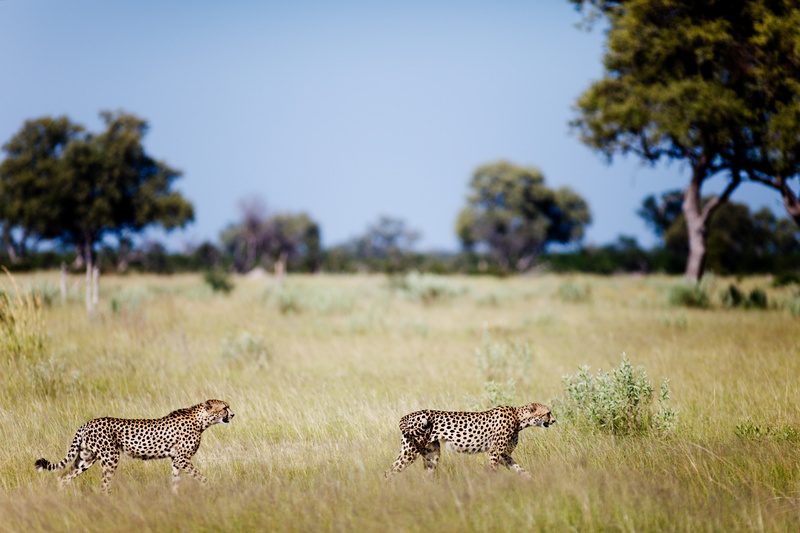 It is so lovely to see different generations of this same leopard family continuing to thrive in the Lebala area. 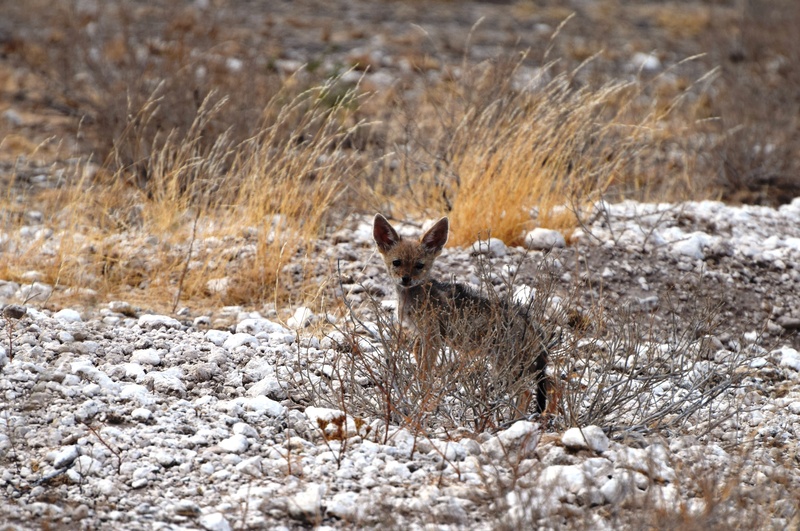 Right along the airstrip road there was an active den for the black-backed jackals with four playful puppies. A serval was often seen stalking prey along the edge of the marsh and a couple of times we found an African wild cat hunting. A fallen strangler fig near to Twin Pools attracted a very large herd of breeding elephants who seemed to loved feasting on the tree. Some of the elephants were lying down horizontally whilst still managing to feed. A herd of twelve buffalo were grazing along the road being followed by lots of cattle egret who were snatching up grasshoppers and other insects disturbed by the large bovines. 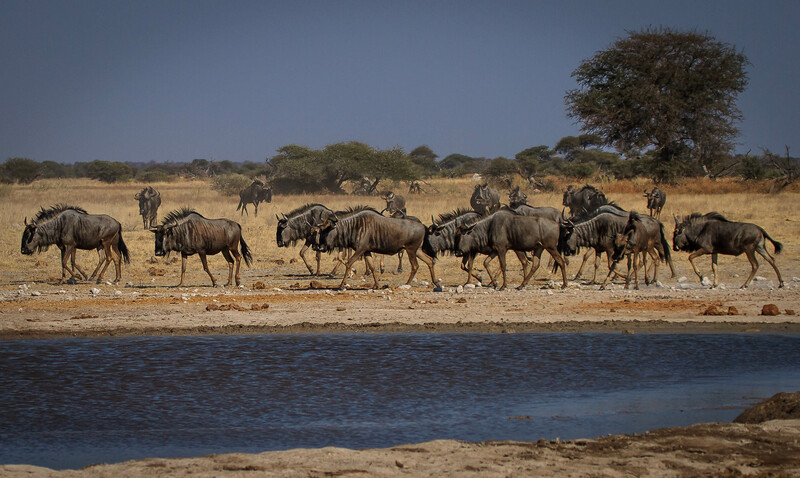 At the start of the month there was extremely good general game in the marsh area; the animals were hanging near to the water as the natural waterholes dried up. Species seen at the time included elephant, giraffe, impala, red lechwe, wildebeest, zebra and hippo. A very relaxed herd of six adult roan antelopes and their two calves were found near to Baobab Pan. In the same area we also located a herd of eight sable, also with two calves. We had lovely bird sightings near to the marsh including openbilled storks, black herons, kingfishers, egrets, swallows and steppe eagles. After some summer rains fell a large number of eagles were seen feeding on termite alates, also known as “flying ants”. We had a great sighting of two rosy-throated longclaws – a very prized sighting for keen birders. There were still a good number of carimine bee-eaters in the area. 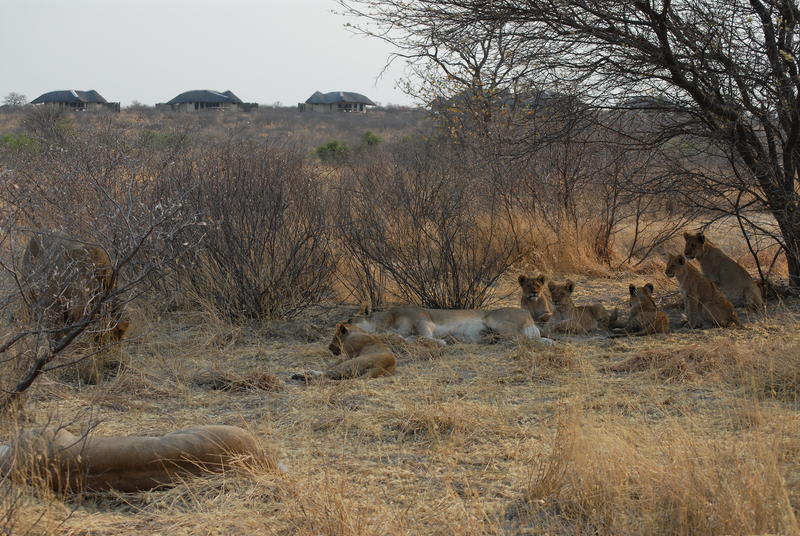 At the start of the December our guides managed to find a lion den with two females looking after four cubs of approximately one month old, whilst another three lions were resting nearby. Initially the lionesses were keeping their young well hidden in the bushes, but later in the month we were able to see the females nursing their cubs. Occasionally we were lucky to catch them out in the open and playing. One lioness killed a tsessebe and we could tell that she dragged it a very long way to bring it nearer to the den site. 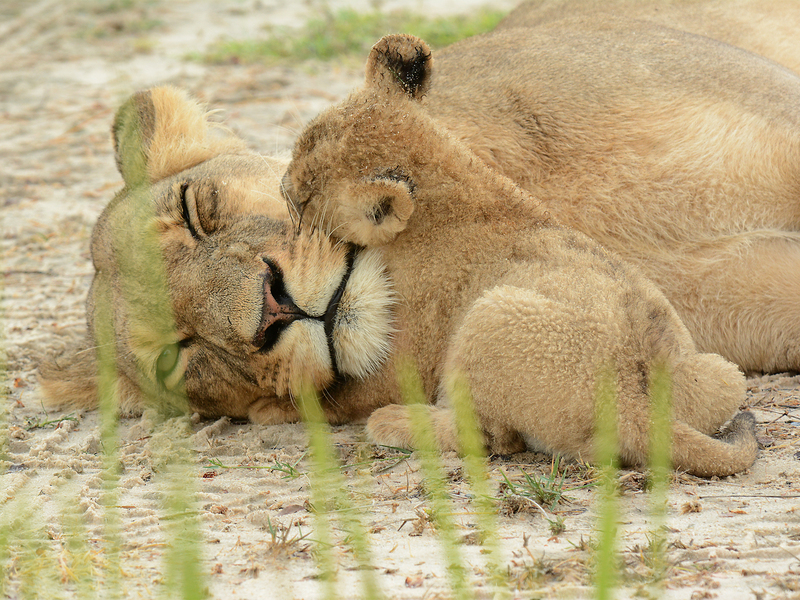 Two male lions were seen mating females for much of the month, so hopefully there will be even more cubs soon. We found two lionesses on a tsessebe carcass that they had killed earlier in the morning. Male lions were seen hunting on hippos near to the channel. The resident pack of six adult wild dogs with their 6-month-old puppy were located finishing an impala carcass one morning. In the afternoon they were hunting again, this time trying their luck on tsessebe and wildebeest. The following day we saw them kill two impalas. One time the puppy tried to chase a family of mongoose who balled up together to defend themselves. We found a leopard near to camp, heading towards the brown hyena den and different tom leopard was seen a couple of times, once resting up on a tree, but he was shy and eventually he jumped down and ran into the blue bushes. The brown hyena cubs continued to do well and were seen regularly. The cubs are still playful and guests were able to get lovely shots of them being active. We enjoyed watching them socialising and sometimes nibbling food that they had been brought by their mother the previous night. Spotted hyena were also seen a few times, mainly patrolling and sometimes within five minutes of camp. They were seen near to the brown hyena den, one time two killed and ate an Egyptian goose right at the den entrance, we will just have to hope that our precious brown hyena cubs do not get attacked by the larger dominant species. Once the summer rains started in earnest towards the end of the month our guides noticed that the spotted hyenas were actively hunting on the rainy nights, specialising on wildebeest. 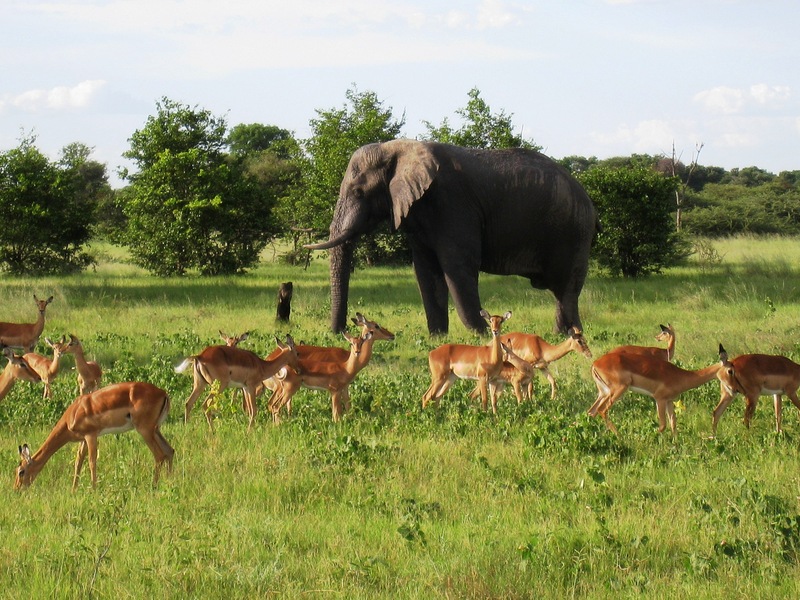 General game was reported to be very good, with elephants and giraffes crossing through the marshes, though after rains towards the end of the month the elephants started to head deeper into the mophane woodlands. A small bush fire followed by rain meant that grazers including roan antelope, tsessebe, eland, impala, kudu, zebra and reedbuck were in good numbers enjoying the new shoots of green grass. Baboons also enjoyed staying in the same area as these herds, presumably seeking protection amongst the plentiful eyes and ears. Many of the antelope species had given birth to their young. A batchelor herd of buffalo were found north of camp. In terms of smaller mammals located, serval, civet, jackals, bat-eared foxes, honey badgers, spring hares and mongoose were all seen during December. We enjoyed a lovely sighting of an African wild cat pouncing on and killing a mouse. There were four species of vultures in the area: white-headed, hooded, lappet-faced and white-backed. Migrants such as the woodland kingfishers, lesser spotted eagles, Wahlberg’s eagles all returned to the Kwando Reserve for the summer. At one point there was a feeding frenzy of some 120 lesser spotted eagles near to the brown hyena den. 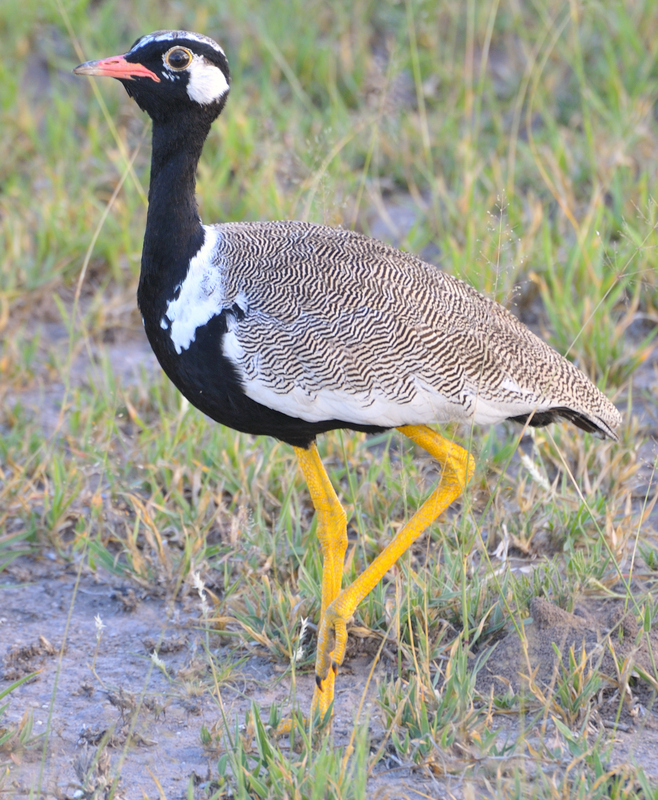 Saddle-billed storks and the elegant wattled cranes were favourites for some of our guests. The two males from the Wapuka Pride were seen alone with two of the females and were mating one of lionesses when a herd of thirty elephants came and chased the lions with lots of trumpeting. It was fascinating to see how the elephants protected their calves by keeping them in the middle of the herd. As with the previous month, both Wapuka Pride and the Bonga lions were overlapping their territories near to camp. One night we heard a hideous commotion and in the morning we found the two prides near to each other looking exhausted. It seemed as though there had been a very serious fight. One of the beauties of driving in the Lebala section of the Kwando Reserve is the wide open areas in which there are many different species of prey such as zebra, giraffe, impala, sable and roan antelope. Although it is an open area, Bonga Pride were cleverly ambushing prey using the base of big leadwood trees as cover. The same lions were often seen near to camp, one day at Room 9 feeding on two wildebeest carcasses that they killed during the night. The two pride males were there with four lionesses and their cubs. 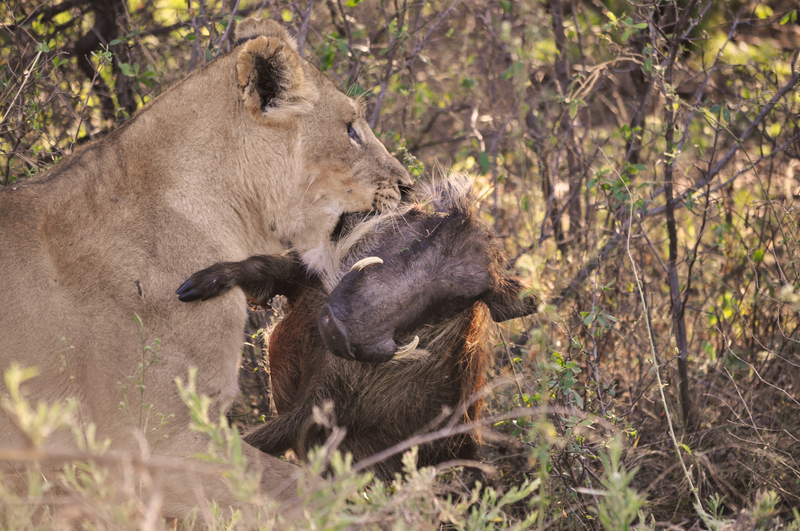 Warthogs and wildebeest seemed to be the main targets for the lions in November. Three subadult male lions had been kicked out of the Bonga Pride by the two dominant males. They looked starving and will quickly need to learn how to survive independently of their mothers. The resident leopard, known as Fisherman due to his preference for the marsh habitats, was seen near to two hyenas who were feeding on a carcass. The guides suspected that the hyenas had stolen the kill from the leopard. We watched as he stalked some red lechwe through the marshes, but in the end the antelope headed into water that was too deep for him to follow. Another time he had killed a warthog up a tree and was enjoying his feast, with a hyena waiting beneath him gobbling up any scraps that fell to the ground. We came across Jane, the well known resident female leopard. Her daughter was now living independently and we found her drinking on another occasion. 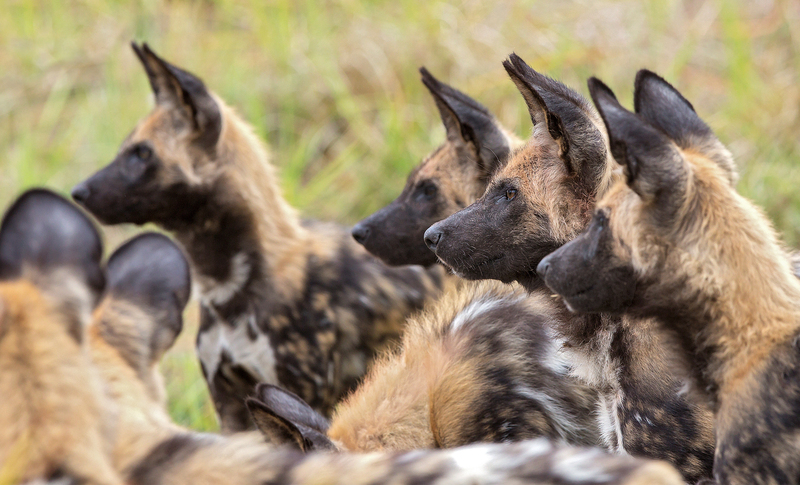 A pack of seven wild dogs (six adults and a puppy) were ranging a very large territory between Lagoon and Lebala camps. The guides suspected that they were changing positions regularly in order to avoid other large predators such as lions and hyena who are numerous in the Kwando Reserve. One day we saw them bring down two impala at once. As they were feeding, within five minutes, four hyenas came and tried to steal the carcasses from the dogs. The pack bravely stood its ground and chased the hyenas away who waited until the dogs had eaten their fill. Another time the Wapoka pride of nine lions were on a hunting mission and flushed out the pack. The guides were worried because two of the dogs appeared to be missing afterwards. The temperatures in November were scorching and we saw many herds of elephants in the river coming down to drink and cool themselves in the mud and water. These breeding herds had lots of youngsters and one evening we watched as the adults helped them across the river by pushing them, some of the calves were holding onto their mothers’ tails. The the river we also enjoyed watching red lechwe jumping across the streams and big herds of zebra and wildebeest drinking. We came across a dead buffalo along the river with lots of vultures up in the trees. All of a sudden, a clan of eight hyena appeared and began to feed on the carcass, pulling it apart vigorously. Four black-backed jackals came and started to steal small pieces of meat. We also found a jackal den near to the airstrip with four playful puppies. Once we saw the adults coming back and regurgitating food for the youngsters to eat. After some rains the monitor lizards started to come further from water in search of food. We had some beautiful sightings of monitor lizards, one was eating tortoise eggs and another one was trying to break small snail shells. We saw several small leopard tortoises. Smaller cats such as African wild cat and serval were seen on night drive, we watched the serval pouncing on a mouse. We were lucky to see a rare sighting of a white-tailed mongoose on our way back to camp one night, the animal was hunting. We also saw honey badgers and a large-spotted genet killing mice on different occasions. Birdlife was also excellent, especially by the river, including egrets, herons, storks and bee-eaters. The trilling call of the Woodland Kingfisher once again echoed around the bush as this beautiful returning migrant came back to Botswana. We followed two lionesses until they stalked a warthog. One lioness went halfway into the den and pulled it out. Then, to everyone’s amazement, a leopard appeared and stalked the lionesses trying to steal the kill. One lioness chased the leopard up a tree to round off an incredible sighting. Although these lionesses specialise on warthogs, we also saw them eating reedbuck and wildebeest. A coalition of three males were tracked trying their luck with some buffaloes at Kwena Lagoon but they were not successful. During the month we found these three male lions fairly often, and they were mating one of the lionesses. The other female led us to a place where she was hiding some very tiny cubs deep in thick bush. We didn’t see the cubs for several days but eventually they came more into the open when we could see that there were four and we were able to watch them suckling. After a few days we watched her moving the two cubs from one set of bushes to another. The two female cubs managed to walk alongside their mother, but the male cubs were lazy and she had to carry them by the scruff of their necks. A single male lion was discovered feeding on an elephant calf. The cat seemed unusually aggressive, so for the sake of safety first we gave it a good deal of space. The resident pack of six adult wild dogs were located often in the middle of the Kwando concession. They still have one of this year’s puppies with them (out of an original litter of eleven). They were not always lucky on their hunts but overall seemed to be doing well and were usually found full-bellied. One time they killed two impalas and another time we saw them take down a roan antelope calf. At the end of the month they brought down an impala and two ostrich chicks in a single morning. The brown hyena cubs were still doing well and we were able to visit them at their den where they could be quite playful. 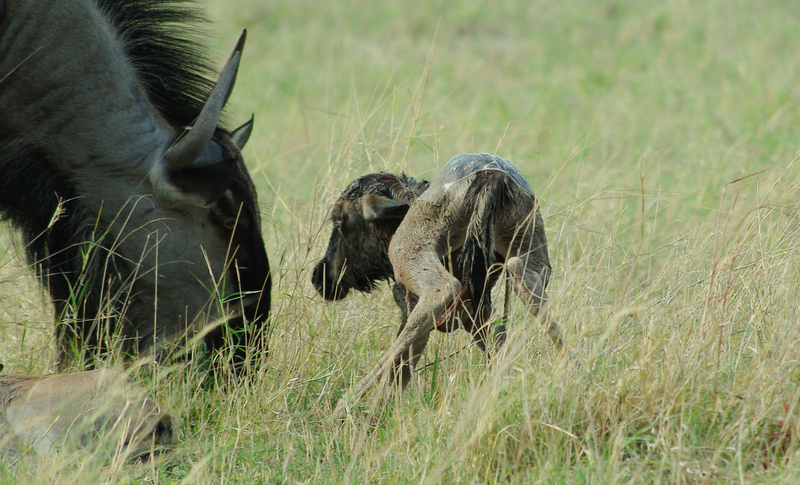 One time we saw them feeding on a fresh impala skin, although the mother hyena was never visible when we visited. Skilled work by the trackers allowed us to locate a sub-adult female leopard. We saw her a few times afterwards, but she was looking hungry and was even unsuccessfully trying to hunt tree squirrels in her desperation for a meal. Life appeared hard for this young female finding her way in the world. Another time she was resting in a tree and we saw her being attacked by a troop of baboons causing her to jump from the tree and hide in the thickets. We were relieved when we found her feeding on a new-born impala lamb. Another adult female leopard was resident in the riverine areas. The coalition of cheetah brothers was also picked up after good tracking from their marking post. After two and a half hours our team was chuffed to find them resting full-bellied with blood on their faces. Mostly these males were specialising in hunting warthog, but we also found them stalking and killing tsessebe a couple of times during November. General game was good, with big herds of elephant, giraffe, kudu, wildebeest, waterbuck and zebra as well as the more elusive sable and roan antelope which were thriving in the mopane woodlands. A small herd of eland were also seen. Some of the antelope species, such as tsessebe and impala were starting to drop their young. Elephants came to the river in front of camp in a daily basis to drink and swim. During night drive our guides were successful in locating aardwolf, honey badgers, servals, caracals and African wild cats. The carmine bee-eater colony at Kwena Lagoon was still active at the start of the month and we were able to watch adults coming back to feed their chicks, but by the end of the month the flock had dwindled to just a few birds. We watched a martial eagle kill a warthog piglet. It is always a pleasure to see the returning summer migrants and in November we were happy to see broad-billed rollers, black kites, yellow-billed kites and blue-cheeked bee-eaters. Year-round residents such as the saddle-billed stork and wattled cranes were also enjoyed by guests. Back at camp the African scops owlet continued to roost by the fireplace whilst Peter’s epauletted fruit bats were identified in the marula tree by the front deck. An African python was seen strangling a baby impala at Kwena Lagoon and a black mamba was briefly seen in the riverine area but it disappeared into the long grass.